We're excited to announce that the Fort Collins band the Catcalls will be our featured band for the Fest of Ale #6. These women have a powerful sound, with enticing guitar licks and captivating vocals. So we won a medal at the 2018 World Beer Cup. Loveland Aleworks took bronze in the fruit beer category for our Guava Sour Ale in the fruit beer category. Thanks to all of our fans, far and wide. This beer is available up and down the front range of Colorado in 22oz bombers. Find out where to purchase by going here, or searching the map below. Our 6th annual Fest-of-Ale party will take place here at the brewery on July 7th from 4-10pm . We will have 3 food trucks, live music, & 12 unique small-batch beers. Tickets are $25 which includes a complimentary tasting glass with unlimited samples, raffle prizes, games, and fun. We tweaked the recipe for this beer by adding a different hop bill and also adding more flaked oats and flaked barley. The result is a beer with more body, greater juicy fruit aroma, and a tiny bit higher ABV. Still a low perceived bitterness and extremely drinkable beer. We've been busy here in the brewhouse packaging up a fresh batch of American Sour Ale with Peaches. A well-balanced tart kettle sour with hints of passionfruit aroma and peach flavor. Finishes with a subtle sweetness. A refreshing and delicious straw-colored sour ale. 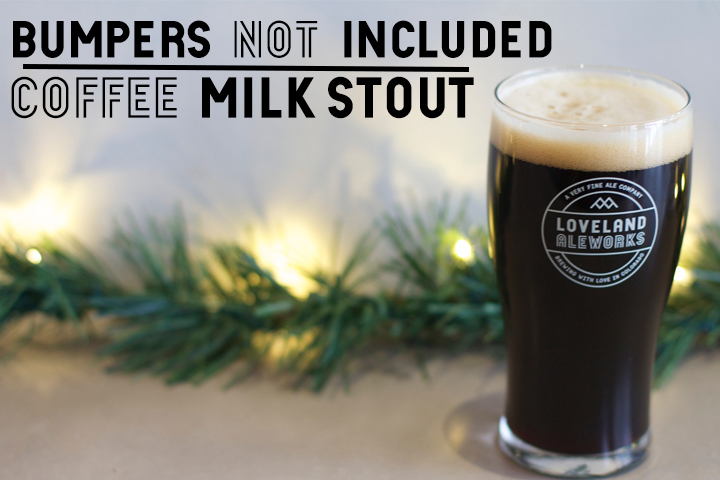 Our latest release, Bumpers not Included: Coffee Milk Stout, has silky tan head, creamy mouthfeel, lightly roasted coffee flavor balanced with stout sweetness. Coffee cold-brewed with lightly we roasted Ethiopian beans. We typically only name our double IPA's here at the brewery. The inspiration for this beer's name came from a Craigslist ad we encountered at the end of the summer. We were looking to get another delivery vehicle, and one was for sale in Gunnison, about 5 hours away from the brewery. The owner was selling it with the 'bumpers not included'. We sent a nice email to the owner stating we were interested if it drove well, and looked good, but going all the way to Gunnison was a long way for a truck that didn't have bumpers. We politely asked if the owner would consider include the bumpers, as this was craigslist and some bargaining is typical of transactions that take place on there. The seller responded with an long expletive fueled email that must have caught him on a bad day. He wasn't selling the truck with bumpers, and he told us we were idiots for asking such a ridiculous question. The diatribe he responded with was funny to our twisted sense of humor, so we knew it had to be a beer name, thus we now have Bumpers NOT Included. With the seller's attitude, we knew the next beer we named would have attitude as well. If you're looking to find Loveland Aleworks beer outside of the taproom, we've updated the map where you can find our beer. Glasses indicate beer is available on draft. Salmon bottles indicate where you can find bottles of our Raspberry sour. Want a winter creative project? We've got extra barrels we need to get rid of. 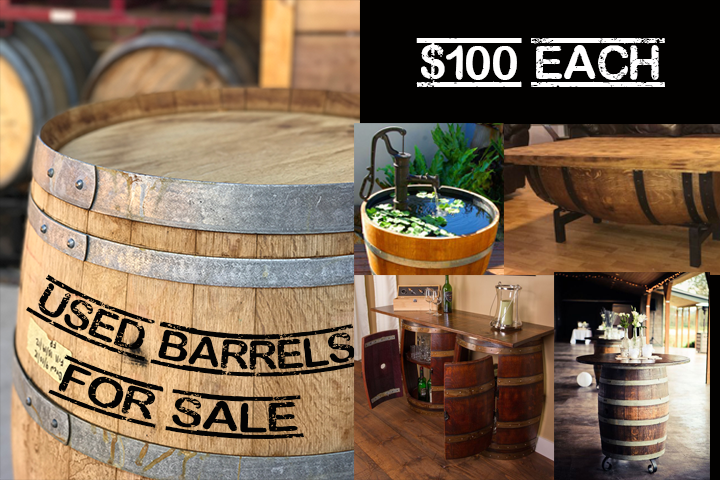 They are $100/barrel or $75/each if you buy 4. Lots of creative ideas out there to draw from on sits like pinterest.